I wrote a big write up at Search Engine Land on the various search related April Fools gimmicks over here. Here, let me focus on the forum threads I found related to questions on the various April Fools jokes. Google went back to 1990 with CADIE: Cognitive Autoheuristic Distributed-Intelligence Entity. In short, the intelligently designed this awesome blog. Honestly, I am not too much into the joke. The funny part is that someone asked "How can I install Gmail Autopilot by CADIE in my gmail account?" Hmm, April Fools! 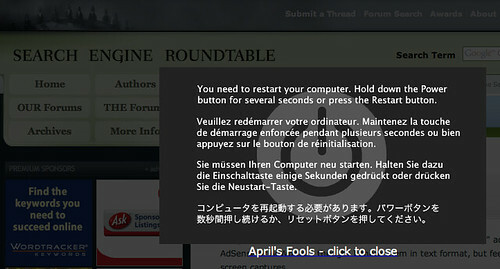 Finally, you may have noticed that visiting this site, will spring you for an April Fools hoax. 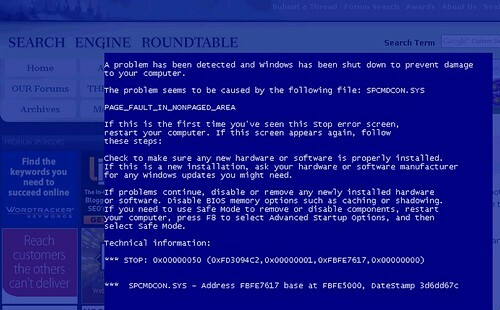 The hoax changes if you are on a PC or Mac. Hope it didn't freak you out too much. Honestly, every time I visit this site and get that hoax, I get nervous. Something about seeing the kernel panic that scares me, even though I know it is a hoax. I wrote a big write up at Search Engine Land on the various search related April Fools gimmicks over here. Forum discussion at Google Web Search Help, Cre8asite Forums and Search Engine Roundtable Forums.